January 20, 1993. We were going home. For four extraordinary years, home had been the White House, but when we woke up that morning, it felt like a foreign place. Our bed, along with our tables and chairs, already were in Texas. George had been telling people that I almost had gone, too. He was right. Once we lost the election, I had tried to ignore the hurt and turned my mind toward Houston and a new life. George, on the other hand, was presidential until the very last moment. He worried about the staff and where they would go. And he had to cope with the larger problems of Iraq, Somalia, and Bosnia. We started that day as we did every morning, waking up about 5:30 A.M., ringing the bell for the butlers, and drinking coffee in bed while we read the papers. Our phone started ringing almost immediately with our children checking in to make sure we were okay. Later in the morning, George called me from the Oval Office and asked if I wanted to walk around the South Grounds with the dogs just one more time. It was a glorious, sunny day. The dogs ran and chased squirrels and dashed around looking for who knows what. The pleasure George got from his dog Ranger taking flying leaps over imaginary logs cannot be described. We talked about the ducks that had been nurtured in the South Grounds fountain the past spring and summer and wondered if they would all come back to roost that spring. If they did, how would the White House groundskeepers cope with all those little families? We walked past the tennis court and the horseshoe pit, where you could always hear the clink of shoes at lunchtime. We wondered if Bill Clinton would keep up the White House horseshoe tournaments. It was a great way to get to know the ninety-three people who kept the People's House in such beautiful shape. We walked hand-in-hand by the swimming pool and the cabana, the Oval Office and the Rose Garden, sharing happy memories. Even writing about that day, the house, and the very thoughtful staff brings a warm feeling to me. We always have lived in happy houses, but nothing matched this special place. The problems George faced there were unbelievable, but the staff surrounded us with goodwill, warmth, and caring. They gave the President of the United States exactly what he needed: a happy, tranquil home. We had put off the good-byes to the residence staff and groundskeepers as long as we could, but at 10:00 A.M., it was time. We had been dreading it. Chief Usher Gary Walters, head of the household, led off with a funny, warm essay about all the new phrases they had learned from George. It read in part: "We thought that 'Pops' were either soft drinks or a breakfast cereal, but we found it to be a term of endearment. We also thought that 'Eeooooh' was something you said when you hit your thumb with a hammer -- not 'Where's Ranger?' We learned that the real name of the presidential retreat in the Catoctin Mountains was Camp Marvin, not Camp David, and that a six-pack does not necessarily refer to beer, but is the means to becoming the horseshoe king." Ron Jones, a houseman and a great horseshoe competitor, presented George with a trophy made in the carpenter shop. The staff also gave him the flag that was flying over the White House on January 20, 1989, and one that had been flying there that morning. Nancy Clarke, the genius in the flower shop, gave me a beautiful doll in a large Lucite case -- a reminder of all the beautiful dolls and other decorations her staff had made for Christmas each year. We had so much fun together decorating the house for formal state dinners and holidays. (I should say she and her shop worked; I admired.) We were too choked up with emotion to say what we felt, but I think they knew the affection we had for them all. Vice President Quayle and Marilyn and George's chief of staff, Jim Baker, and Susan arrived, along with my outstanding chief of staff, Susan Porter Rose. We talked for a few moments, and then right on time -- at least I thought it was right on time -- the Clintons, Gores, and the other guests arrived. I say that because I read in the paper that they were late. I don't think that was true. The ladies looked great and both wore hats. It reminded me of how critical everyone had been about Marilyn Quayle's hat four years before, and I wondered if Hillary and Tipper would get away with theirs. The time probably dragged for the newcomers, but it raced for me. When we were told we must leave for the ceremony, I rushed around, through the Red Room then back into the Blue Room, to hug the butlers, out of sight of everyone else. How dear they had been to us and our family. From then on, it was all downhill. The hard part for me was over. I rode to the Capitol with Hillary, and the conversation was relaxed and easy as we talked about the long day ahead. It could have been an awkward time, but I think we were both determined it would not be. People waved at the new First Family, as they should have, and everyone looked very happy. Then came the moment when the mantle was lifted from the back of my superb husband and placed on Bill Clinton's. It will come as no surprise that I felt a lesser man by far had won the election, but that was behind us now. The speeches were fine. Bill Clinton's was short and sounded very familiar -- like John F. Kennedy's, but not quite as eloquent. We said good-bye to Senator Bob Dole and Elizabeth, Senator Alan Simpson and Ann, the Clintons, and the Gores. The loyal Quayles flew with us to Andrews Air Force Base, where we hugged goodbye. After a great send-off from staff and supporters, we flew to Houston on Air Force One surrounded by friends. From my staff we had Susan Porter Rose and Laurie Firestone, both remarkable women who had been with us for twelve years. My great and dear friend Andy Stewart was there along with Richard Moore, the former ambassador to Ireland, and so many others. Every person on that plane was someone we hold very dear. The press complained bitterly to me that they were not being allowed to send a press pool. That amused me, and I told them that any one of them who had voted for George should speak up then or forever hold his peace. The silence was deafening. During the flight we watched a film put together by Dorrance Smith, a Houston childhood friend of our children, and more recently George's communications director and tennis opponent. It was very funny, very tongue-in-cheek. He had interviewed many of George's staff, and two of our children, Marvin and Doro. It poked fun at us, and it lightened the day. We arrived in Houston to a great airport rally and immediately saw so many old friends. We said good-bye to the people who had flown down with us, as most of them were going back to Washington with the plane. We did not expect the welcome we received. Everywhere we looked were yellow ribbons. Stores and motels had WELCOME HOME on their marquees. There were billboards with WELCOME HOME, GEORGE AND BARBARA. There were even homemade signs on the backs of pickup trucks. People stood and waved flags along the entire route. When we pulled up to our rented house, the neighbors were all out to give us a big welcome. It was so sweet, and made everything look brighter and better. There were even more surprises ahead. We walked into a house that was unpacked and filled with plants and flowers. Paula Rendon, our beloved housekeeper; dear Don Rhodes, who had been with us for years; and our friend and neighbor Jack Fitch had worked like dogs sorting out what should be stored and what should be opened. Jack's wife, Bobbie, organized the neighborhood to put flowers in the house and in the garden. What a wonderful way to come home. January 21, 1993 -- What a difference twenty-four hours make. We awakened at our usual time of 5:30 a.m. -- but we had no bell to ring and no butlers. We got up, walked and fed the dogs, picked up the papers, and carried coffee upstairs to read in bed. Barbara Bush (1925—2018) was born in Rye, New York, and married George H.W. Bush in 1945. 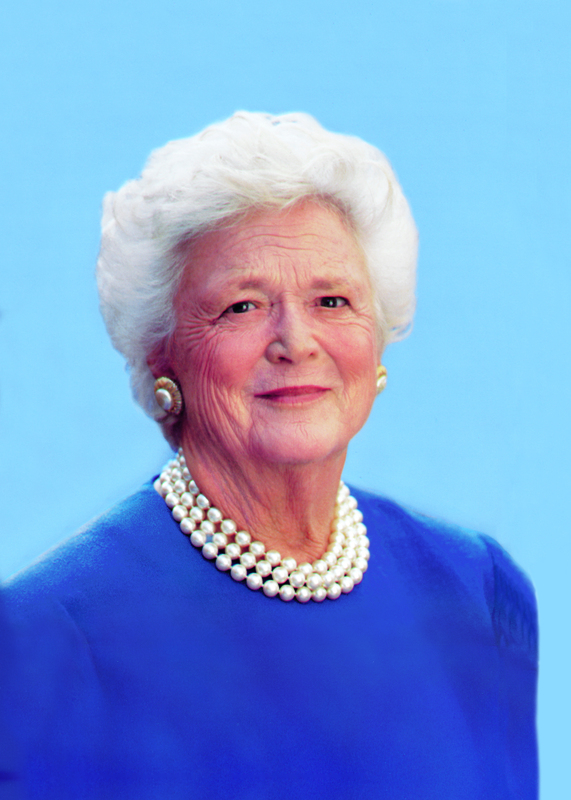 She served as First Lady of the United States from 1989 to 1993. She has five children, including President George W. Bush and Florida Governor Jeb Bush, seventeen grandchildren, and eight great-grandchildren. 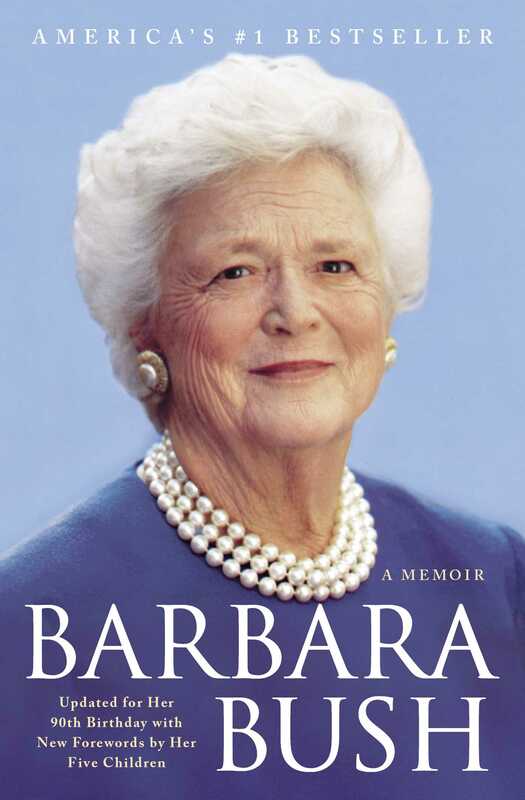 She founded the Barbara Bush Foundation for Family Literacy. She lived in Houston, Texas, and Kennebunkport, Maine. – Maureen Dowd, "The New York Times Book Review"